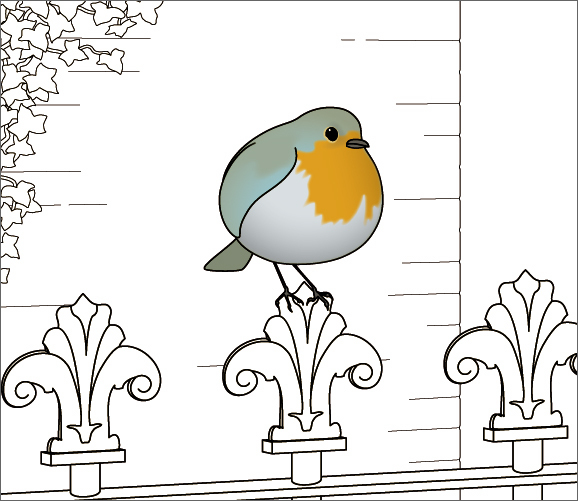 Today I’ve seen the fattest robin I’ve ever come across in my life. He looked like a ball of fluff, out of which two tiny eyes, a small beak and thin long legs were sticking out. He wasn’t just fat but also incredibly cheerful. Well, at least until I went near him. He was singing like there is no tomorrow, it was actually amazing to see how such a small creature could emit such a powerful, loud sound. I wish I could understand what he was saying, for I’m positive that he must have been saying something. Somebody putting such an effort into singing, can’t be doing it just because there’s nothing else to do. Fat and chirpy. Even though I was never a big fan of Pavarotti, he looked pretty much like the bird version of him. So I thought that maybe he didn’t want an audience after all. So, reluctantly, I walked away. On my way to my studio every morning I walk through the park. Very often I meet a beautiful blackbird. I know it’s always him because he has a very distinctive mark that makes him stand out: he has two big white spots on his cheeks. Quite fetching, I must say. 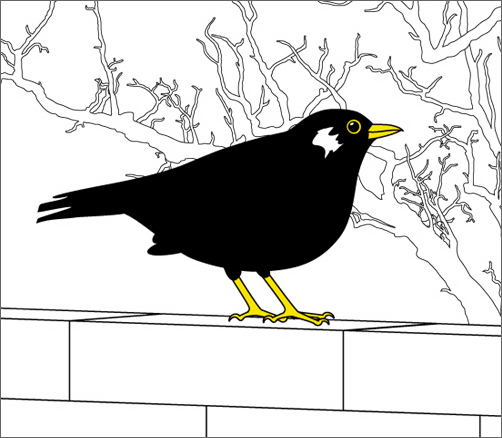 And yes, it’s definitely a “he”: as some of you might know, only the male blackbird is actually black. The female is in fact dark brown. Now, I like giving names to what or who I see on a regular basis during my morning walk (all the people I regularly meet have nicknames in my head) and starting from the word ‘cheek’, I naturally thought I should name him Cheeko. This is because the nickname my parents and sister have used for me since I was a child is Cico, which -despite the different spelling- in Italian pronounces exactly like that: ‘chee-koh’, like the Spanish word ‘chico’. My sister once tried to call me Massimo and I asked her if she’d gone stupid. That’s how used I am to that. He’s quite plump (half of the times I see him, he’s slurping down some fat earthworm he’s just dug out from the soil), cheerful (and blackbirds’ singing is one of the nicest among all birds’) and bouncy. Sometimes I wonder if his white cheeks are a problem for him. Maybe his fellow birds bully him or mock him because of those (“Hey, whitey!”, or “Ooh, have you fallen into a bottle of bleach?” and stuff like that). Or in fact maybe they think he’s more special than others and look up to him. Hard to say. But somehow he strikes me as being quite lonely, sort of an underdog of blackbirds. An under-bird.